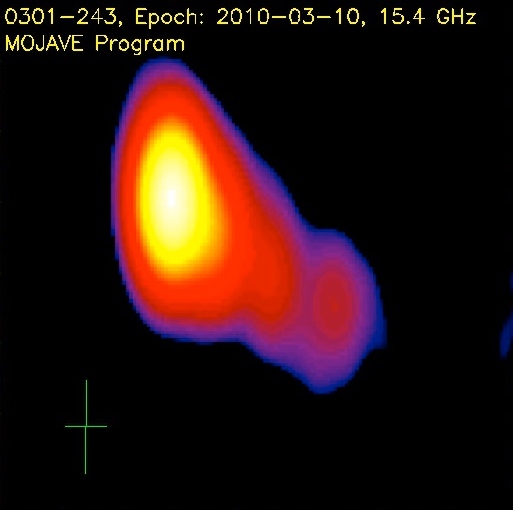 Mojave VLBA radio image of the BL Lac object PKS 0301-243, looking essentially on-axis at the jet emerging from the supermassive black hole. PKS 0301-243 is a blazar at redshift z=0.266. 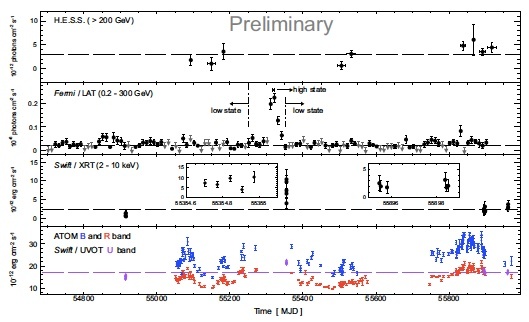 This - for very high energy gamma ray standards - high redshift makes PKS 0301-243 an interesting object to study absoption of gamma rays by interaction with the extragalactic background light (see SOM Jan. 2013). The target has been observed with H.E.S.S. 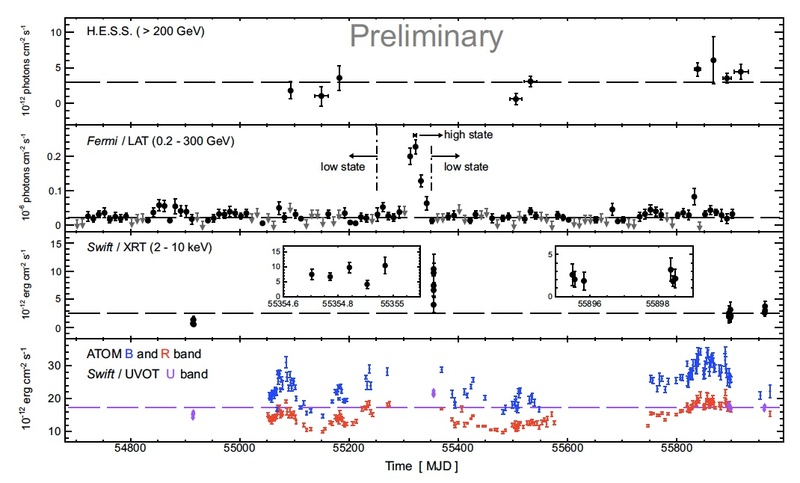 between 2009 and 2011 for a total of 42 h of good data, resulting in a clear detection (Fig. 1). 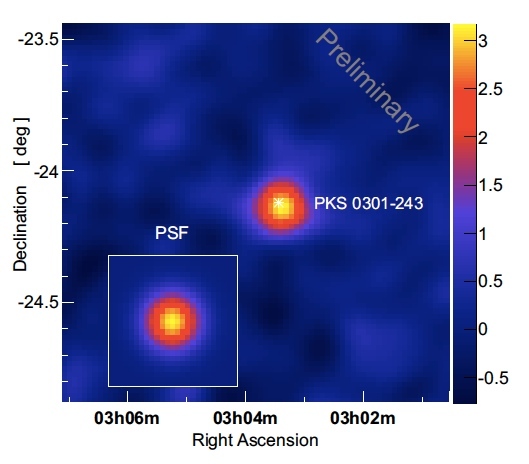 In addition, PKS 0301−243 has been observed in the past few years in other wavelengths by the Fermi and Swift satellites as well as with the optical telescope ATOM on the H.E.S.S. site, giving precious insights in the spectral energy distribution of the source, and probing its variability. Fig. 2 shows the resulting light curve. The LAT pair conversion instrument onboard the Fermi satellite, sensitive to gamma-rays between 100 MeV to more than 300 GeV, observed in April 2010 a very bright flaring episode of culminating around April 28, 2010 (A. Cannon, 2010). Outside this period, as well as for very high energy gamma rays, no strong variability is observed; during the flare, the object was unfortunately not visible for H.E.S.S.. In the optical range, the ATOM robotic telescope did see continous variability of the source (bottom panel in Fig. 2). The spectral energy distribution (SED) of PKS 0301−243 using these multi-wavelength data, as well as infrared and radio archival data, is shown in Fig. 3. A low-energy component presumably due to synchrotron radiation peaks in the optical. For the second, high-energy component a pronounced break is evident between the Fermi and H.E.S.S. energy domains. Most of this break in the spectrum can be attributed to the onset of gamma-ray absorption by electron-positron pair production on background photons; at this redshift, the optical depth for absorption reaches unity around 300 GeV, and increases steeply thereafter (see e.g. Fig. 1 of SOM Jan. 2013). Fig. 1: Gamma-ray sky map for the region of PKS 0301-243. The gamma-ray excess corresponds to 9.8 sigma. The inset shows the response of the instrument for a point source. Fig. 2: The multi-wavelength light curves for PKS 0301−243. From top to bottom: very high energy gamma ray light curve from H.E.S.S. 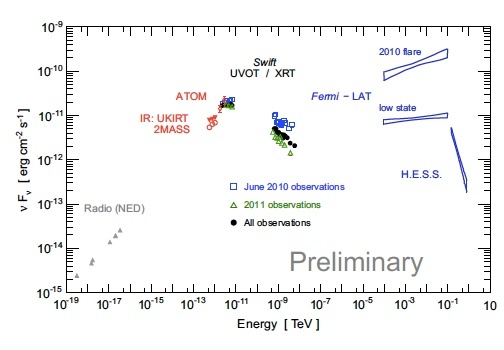 data, Fermi/LAT high-energy gamma ray data, Swift/XRT X-ray light curve, and ATOM B (blue points) and R (red) band optical data together with UVOT measurements in U band (purple diamonds). Click image for larger version. Fig. 3: Energy distribution across the electromagnetic spectrum for radiation from PKS 0301−243, with the characteristic low-energy and high-energy peaks.